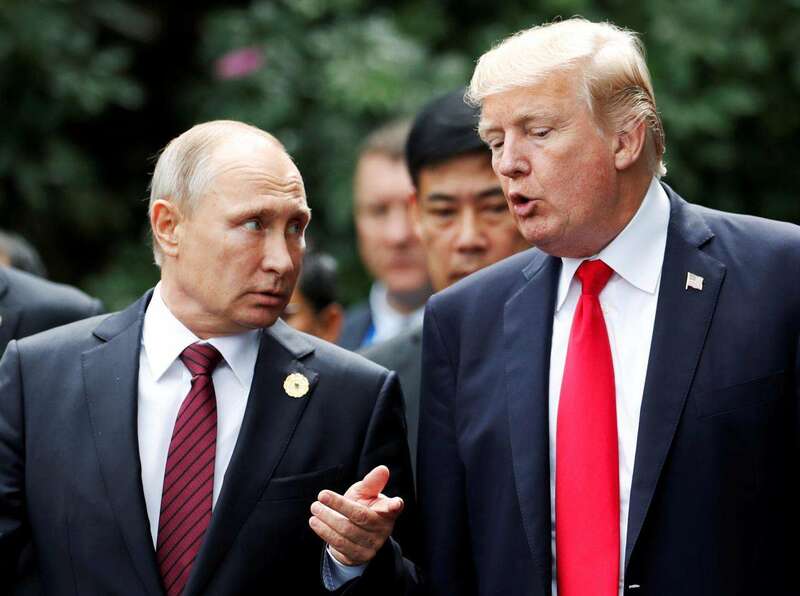 U.S. President Donald Trump and Russian President Vladimir Putin will hold their first summit on July 16 in Helsinki, Finland. The meeting comes at a time of uneasy relations between their countries. In recent years, the two sides have disagreed about a number of issues. They include Russia's involvement in the Ukraine conflict and its support of Syrian President Bashar al-Assad. In addition, United States officials have accused Russia of attempting to influence the 2016 U.S. elections. Before Trump arrives in Finland, he will attend a NATO meeting in Belgium, and make stops in Britain and Scotland. Speaking to reporters before he left for Europe, the president predicted his talks with Putin may be the "easiest" during his trip. While Trump said he "can't say right now" whether Putin is a friend or enemy, he did call the Russian president a "competitor." Helsinki has a rich history of high-level negotiations between the leaders of the nuclear powers. It will be the fourth time the top leaders from the two sides will meet there. Finland has historically been used as neutral territory since Russia was part of the Soviet Union. It was chosen as a place for the two sides to hold high-level talks on major issues. Finland fought Soviet forces during World War II and signed a cooperation deal with the Soviet government in 1948. Before the Soviet Union collapsed, Finland permitted Soviet influence on its national and international policies, while officially keeping its independence. The Finnish government sought to keep an even balance between the Soviet Union and the United States. Both powers used Finland as a base for intelligence-gathering operations. Finland often offered Helsinki as a meeting place for negotiations between the Soviet Union and Western nations. In an effort to be seen as truly neutral, Finland never joined NATO or the Warsaw Pact, the defense treaty signed by the Soviet Union and its allies. Mikko Majander is a Finnish historian. He told Radio Free Europe that Finland sought an "active policy" of neutrality. "Finland was between the blocs, East and West," he said. "And by offering good services to international diplomacy, kind of strengthened its position." Helsinki's most famous security summit came in 1975, with U.S. President Gerald Ford and Soviet leader Leonid Brezhnev. The meeting resulted in the signing of an agreement known as the Helsinki Accords. These were a set of guidelines - including territorial issues and human rights – on ties between the United States, the Soviet Union and 33 European countries. Brezhnev and Ford also held arms-control talks at their Helsinki summit. Then U.S. Secretary of State Henry Kissinger described those talks as "very useful." Jussi Hanhimaki is a Finnish historian with the Graduate Institute of Geneva. He said the 1975 summit represented a "major goal of Finnish diplomacy in the early 1970s." The next meeting of U.S. and Soviet leaders in Helsinki took place in September 1990. That is when U.S. President George Bush met with Soviet leader Mikhail Gorbachev. Their talks mainly dealt with a major international event at the time, Iraq's invasion of Kuwait. Two years earlier, then U.S. President Ronald Reagan, stopped in Helsinki on his way to Moscow for a summit with Gorbachev. During his three-day visit to Finland, he declared in a speech there was "no true international security without respect for human rights." The most recent summit in Helsinki was held in 1997. It involved U.S. President Bill Clinton and Russian President Boris Yeltsin. They discussed several major issues, including Russia's strong opposition to NATO expansion into nations once belonging to the Soviet Union. Finland joined the European Union following the collapse of the Soviet Union, but has still not joined NATO. It is now part of the alliance's Partnership for Peace program, which permits Finnish troops to take part in NATO peacekeeping operations. Customers are drawing in their horns at a time of high interest rates. Peace and development are two major issues in the world today. China's armed forces are the initiator and facilitator of and participant in international security cooperation. 5.In an effort to be seen as truly neutral, Finland never joined NATO or the Warsaw Pact, the defense treaty signed by the Soviet Union and its allies. 6.It is now part of the alliance's Partnership for Peace program, which permits Finnish troops to take part in NATO peacekeeping operations.